Descender #1 - Written by Jeff Lemire, illustrated by Dustin Nguyen, lettered and designed by Steve Wands, published by Image Comics. The Planet Niyrata is one of nine Core Planets known as The United Galactic Council. Residing on Niyrata is one Dr. Quon, lead robotics expert, who is called upon to lend his expert advice when nine mysterious, monstrous robots — one for each planet in the UGC — suddenly appear and act. Ten years later, a young boy, Tim-21, awakens on a mining colony moon. Completely alone, save for his trusty robotic dog, Bandit, Tim-21 attempts to find other inhabitants of the colony just as a ship lands on the deserted moon. I loved reading this fantastic comic. It was the second book I read Wednesday evening as I sat sipping an imperial dark rye beer. Donist World intern Amy (my wife) and Tulip slept quietly upstairs, and the night was my own. Descender transported me back to my early years of watching ’80s sci-fi films like Blade Runner, and Alien. Not so much the subject matter of those films, but more the overall mood of each, back when films focused less on special effects (which are tremendous in those films, btw), but rather the actual story and the feeling of living in those worlds. 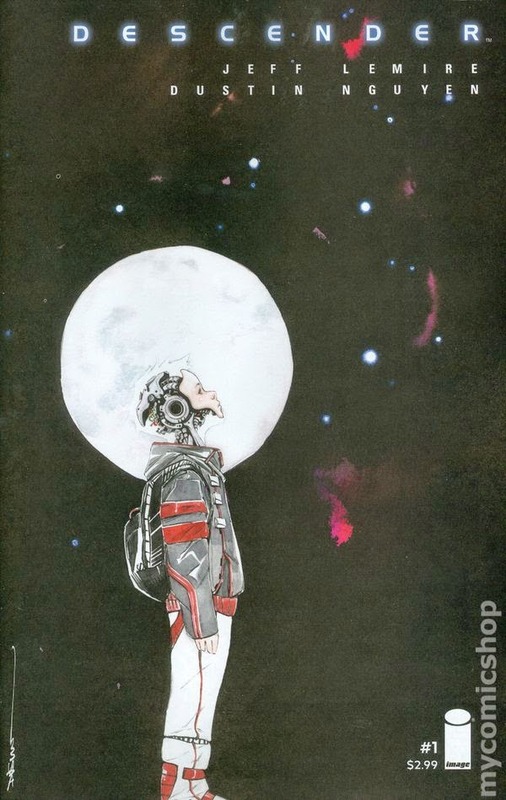 Descender also reminded me of my first exposures to anime such as Akira and Robot Carnival, or television shows Starblazers and Macross. 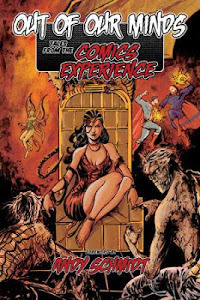 This comic also has a strong Epic comics vibe found in such titles as Moonshadow, or Six From Sirius, as well as a dash of the less-risqué moments from Heavy Metal Magazine. The story, the tone, the illustrations all brought me back, and by the time I set the book down, I was smiling, warmed…and desperately wanting to read the next issue. As I’ve alluded to, there’s no grand cosmic battles, no robots gearing up for war as they scream cries for vengeance, no chase scenes across the universe. Instead, Lemire and Nguyen introduce us to a world (one of nine), Dr. Quon, and the enormous robot — one of the Harvesters as they are called — that nearly ended all life on the nine planets. We only catch a few glimpses of the destruction wrought by the Harvesters, that event is mostly a footnote as we jump forward ten years to meet Tim-21 and see the emotional state of Dr. Quon. We don’t need explicit death and violence, the creators allow us to fill in those gaps on our own with the before and after look at Niyrata. Again, I come back to the wonderful tone of the book, which is equal parts Lemire’s story, narration, character development, and Nguyen’s gorgeous watercolored art. Lemire immediately grabbed me with Dr. Quon and Tim-21, even more so than the appearance, destructive force, and vanishing of the giant robot; the addition of the robotic dog is a deal-sealing treat. Nguyen’s painted art is exactly that: beautifully painted works of art. Again, each panel of each page reminds me of the ’80s work from such greats as Jon J. Muth, Kent Williams, and Scott Hampton, while at the same time Nguyen makes the look his own. The splash page with Tim and Bandit, the double-page spread of the giant robot, and the last page splash are prime examples of the mastery Nguyen is employing on Descender, with each of those pages deserving more than a moment to linger over and appreciate. Separately, the story and art are worthy of respect, but together they are amazing. Even the title page — exactly that, a sans-serif, uppercase title across a strip of the universe, a subheader, and two-thirds of the page being white space — is a triumph, and comes at the exact right time in the book with great impact. Okay, denizens, there’s a reason why Descender was optioned for film approximately a month before the first issue even debuted, and to understand why, you just have to check this comic out. If you are looking for action, fights, and the such, then this is probably not the book for you. But if you want a gorgeously illustrated, expertly-crafted story that looks to be epic in scope, and you do not yet own this comic, then grab your car keys and get thee to thy LCS. Descender looks to be something special and this lengthy first issue does best what every first issue should…leave the reader exceptionally interested in seeing where we are headed next. I can’t wait. VERY HIGHLY RECOMMENDED! 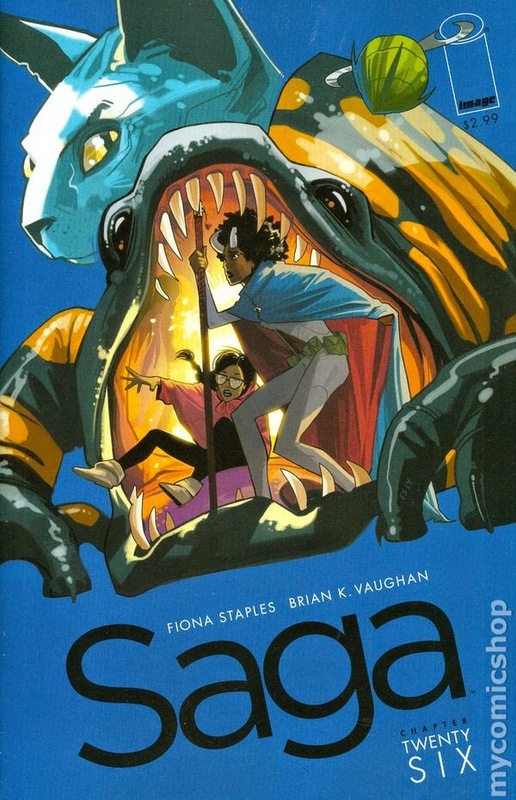 Saga #26 - Written by Brian K. Vaughan, illustrated by Fiona Staples, lettered and designed by Fonografiks, coordinated by Eric Stephenson, published by Image Comics. The Last Revolution arrives and they are very much interested in Hazel, but has Dengo, the robot, gone too far? Marko’s little incident at the alien equivalent of 7-11 looks to bring all sorts of trouble to his group…in more ways than one. The youngest, most vulnerable member of Gwendolyn’s group looks to hold the answer to the dragon problem and finally curing The Will. Not a whole lot happens in this month’s installment of Saga, as we follow each of the three groups, but that doesn’t mean the issue isn’t a nerve-wracking bundle of fun. 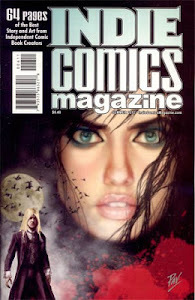 This issue is all about character development: a sunken-eyed, desperate Marko loses control not once, but three times over his missing family; Prince Robot IV has mellowed slightly in his search for his son, and taken to wearing an all-black version of his outfit; Sophie is unusually bright for her age, but Gwendolyn’s treatment might be taking a toll; the insane Dengo might be doubting his own actions. In addition to our normal three groups of characters, we also have a new player (the one with the rifle, who bears an uncanny resemblance to another past character), and the members of The Last Revolution who we first saw at the end of last issue. So, yeah, there is a lot going on, but every moment of my favorite comic on the stands grabs and holds my interest and leaves me desperate to see what happens next. It’s Brian K. Vaughan, denizens, you already know the story’s gonna rock your socks off — which is why I wear fuzzy slippers when I read this book — and with Fiona Staple’s gorgeous line work and vibrant, close-to-flats coloring (a compliment to the exceptional look) on the characters, you know you’re in good hands on this sci-fi, adventure odyssey. The truth is: I’m in love with this book. I have the issues, the trades, the hardcover, and even a digital copy of the hardcover…I just wish I pulled the trigger on that Lying Cat t-shirt before they vanished. Anyhow, you’re buying this, right? You gotta be. If not, do the right thing and get the first four trades, and/or the Deluxe Edition hardcover (contains the first three trades) and catch up on this hit comic…you’ll be glad you did. HIGHLY RECOMMENDED! 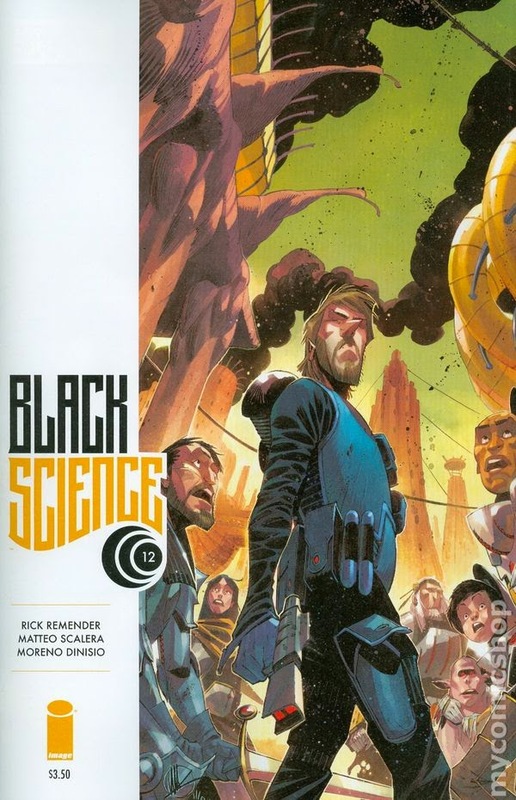 Black Science #12 - Written by Rick Remender, illustrated by Matteo Scalera, colored by Moreno Dinisio, lettered by Rus Wooton, edited by Sebastian Girner, published by Image Comics. Grant McKay is back, and we learn exactly how that has come to be. But like everything since the Pillar was first activated, things just keep going wrong. No sooner does McKay — our McKay — reunite with what remains of his team, than an alternate universe version of Grant and his wife arrive, only to have Rebecca, Grant’s former mistress, kill alt-Grant. On top of that, the new world they are visiting happens to be populated by fanatics who have reason to be angry. Admittedly, I desperately needed the “The Story Thus Far…” on the inside cover as I had forgotten most of what had happened prior to this issue. I was also tired and fading fast at the time of reading, which made remembering the past, connecting it to this issue, and keeping up with the fast pace of events a chore. I reread the issue the next morning and I’m glad I did. The creators give us the first five pages to explain what happened to Grant, and the roller coaster ride resumes as we follow Pia as she chases her alt-mother through the streets of this new, hostile world inhabited by a new enemy. Scalera’s storytelling is as exciting and frantic as ever as the armored enemy chases Pia through what looks to be a mostly-abandoned city. New colorist Dinisio keeps the style of the book in line with what we have come to associate with Black Science, but he adds a cool, otherworldly highlight style to the McKay flashback scenes worth appreciating. So, lesson learned: it is best to be rested in mind and body before reading an issue of Black Science; having a “The Story Thus Far” section only helps. If you are not reading this sci-fi, world-hopping, adventure thriller, you can easily catch up with the first two trades, as you should. I continue to love this book, and I think once this third arc wraps, it will be high time to reread Black Science from the beginning and take in the thrills and chills all in one fell swoop. So much fun! HIGHLY RECOMMENDED! God Hates Astronauts #6 - Written and illustrated by Ryan Browne, colored by Jordan Boyd, lettered by Chris Crank and Ryan Browne, edited by Jordan Browne, designed by Thomas Quinn, published by Image Comics. Star Grass dead and Starrior defeated by their own superpowered baby daughter who is mad on a cookie-based sugar high? A giant mecha-tiger-humanoid robot piloted by crab people? 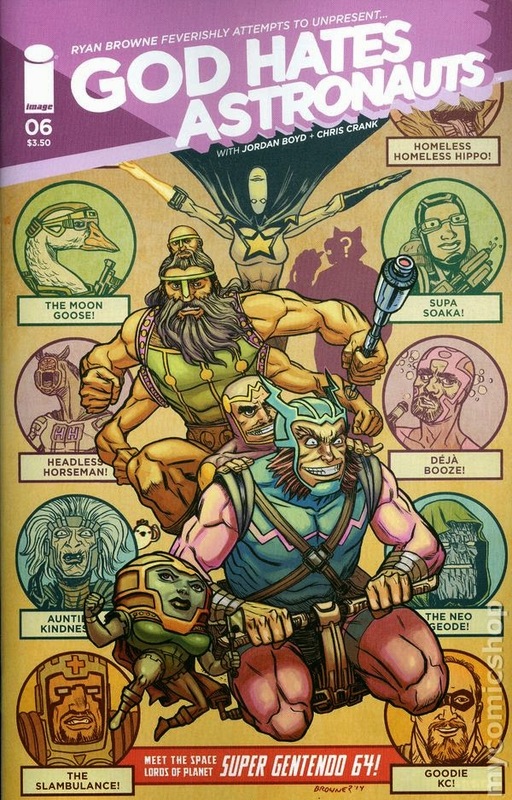 Mecha giraffes, hippo barbarian warriors riding chariots drawn by heavily-armed astronaut centaurs, and salmon-loving starbear warriors? You betcha! Heck, and I didn’t even get into the Anti-Mugger arrested and being taken downtown by Detective Lebronson astride a giant, mustached turtle. Oh yeah, the Super Gentendians arrive! I promise you, denizens, I didn’t make up a single thing in the above paragraph. To be honest, a bunch of other balls-mad stuff goes down in this issue that left me shaking my head in a what the hell am I reading sort of way, but you want to know a little secret? I love every panel of Browne’s insane comic. The thing about God Hates Astronauts is that although creating something over-the-top, and weird is not all that difficult, doing it well to where readers want to come back month(ish) after month(ish) is a darn-fine skill few people have. Browne is not overtly forcing the craziness into his book, he’s just creating the story he wants to tell, as opposed to calculating what joke will work best for a specific demographic as determined by past industry research and standards. This stuff comes naturally to Browne, and although this comic is insane, there is indeed a story, and his immense storytelling skills bring sense to the nonsense. Dang, Browne’s dreams must be messed-up beyond all reckoning…respect! Don’t just jump into God Hates Astronauts if you have not already been following along. You could follow what’s going on — the nice one-page recap, and the two-page flashback bring you up to speed — but the first and second trades are must-read collections that will introduce you to the characters and the insane world they inhabit. If you find yourself at the least smiling, and at the most having difficulty reading the book on account of the laughter tears, then I know you’ll jump to single issues to keep the good times rolling. HIGHLY RECOMMENDED! 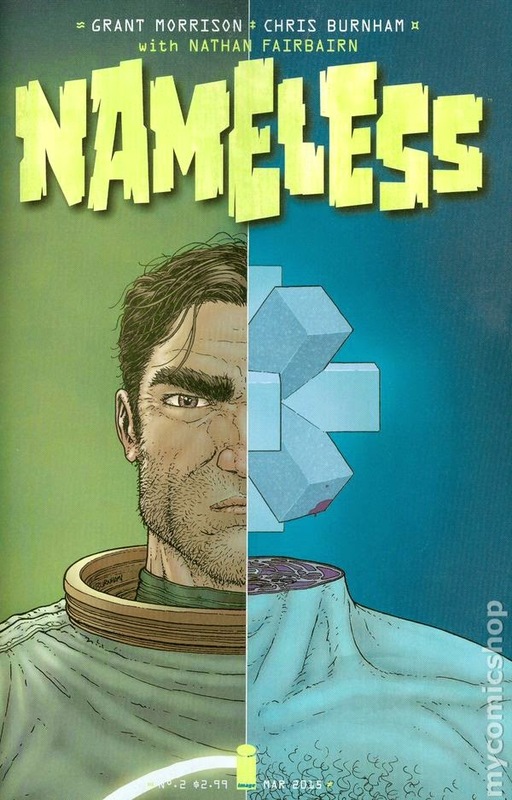 Nameless #2 - Written by Grant Morrison, illustrated by Chris Burnam, colored by Nathan Fairbairn, lettered by Simon Bowland, published by Image Comics. Oh Criminy…here we go, let’s try to do this. Ummmm…Nameless and his fellow astronauts arrive on a secret moon base of epic wonders to discuss the life-destroying asteroid headed toward Earth. Unfortunately for Nameless, the journey for those unaccustomed to space travel is not an easy one. It also doesn’t help that one of the world’s leading superscientists went mad and decapitated a coworker, and she is now spouting a curse in the ancient language of angels…not something the surviving superscientists want to hear. Okay, I guess writing about what I had just read is the best way of figuring out what it actually was I just read. If you are a Morrison fan than you are no stranger to floating in a somewhat-lost, delirious haze in the man’s wake as he travels about the aether. Thankfully, Burnam’s gorgeous art provides somewhat of a four-dimensional roadmap to where this story is headed. If any of that makes sense to you, then you’re probably already reading Nameless and you probably understand a little more about what is going on than I do; that, or you’re lying. All joking aside, I really enjoyed this issue, and I actually feel like I’m following the story a bit better than I was than with the first. Morrison and Burnam do leave us with a few answers regarding the asteroid and the man behind the drones, but those answers raise many more questions, which pique my interest in this series even more. I may not fully understand what is going on (yet) in this comic, but I am very curious to see what happens next. If you’re unsure whether this book is for your or not, then just look at the creators involved and you should have your answer. Or, if you’re up for a bizarre, challenging, cerebral, sci-fi story, then rush out and buy the first and second issues. Once you read them, I’m sure I’ll see you drifting amidst the cosmos with the rest of us; just be sure to wave hello. RECOMMENDED! Swamp Thing #40 - Written by Charles Soule, illustrated by Jesus Saiz, inked by Jesus Saiz and Javi Pina, colored by June Chung, lettered by Travis Lanham, published by DC Comics. The end is here. It is vegetation versus machine and rot and fungus for the sake of the world as we know it. Anyhow, this issue rushes by so many plot points that little has a chance to make much of an impact. The avatars of the green move to attack Arcane after Alec orders them to. Arcane kills one of them (even though he is alone and on their turf), and bails. The avatars want vengeance, but then Alec says forget it. Okay… Arcane returns to the Machine Queen, the avatars of the Green chat for a while, Seeder joins the cause, the Alec Monster gleefully kills itself, and the Green goes to war with the Machine, the Grey, and the Rot. Someone goes, “Oh, but what about the Red,” and Alec shrugs his shoulders in a beats me manner; that’s the last and only reference to the red in this issue. The battle is cool, although over way too fast. We go meta with Alec meeting the Story (? 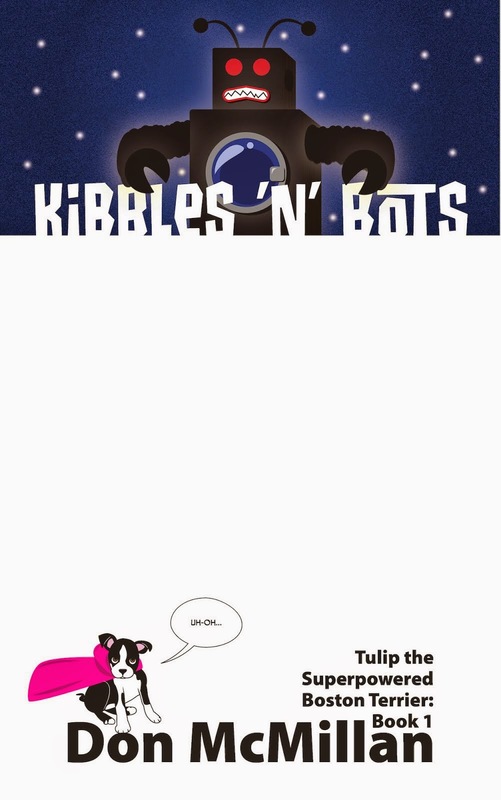 ), then he magically reengages in the battle and takes out the Machine Queen as if she was nothing, a robot dog in a storage shed, and the end with Abby sitting in the grass (but not killing it, she’s still an avatar of the Rot, right? ), as Alec reads one of my favorite novels of all time before going “Hhn.” The end. Now, if all of what I have written above seems abrupt and jarring, then know that is exactly the flow of this issue. I will say that Saiz’s art is as gorgeous as ever, and he draws some mean battle scenes and he has some phenomenal character designs for the former avatars of the Green. Luckily, he was not rushed, or forced to shoehorn a six-issue story arc or two into one oversized issue as Soule was. That said, all of the griping and whining and fanboy rage (not really, I’m cool with it) aside, I still enjoyed many aspects of the issue. Hey, if I didn't like it in the end, I wouldn’t spend the words writing about it. The battle is cool, the avatars are cool, and I don’t really know what to make of the Story — we weren’t given the time to get to know them after all — there was still much to enjoy. Although I wish DC had contacted me to write the final twelve issues…okay, ten issues…six?…I am thankful that although the story’s ending was disjointed and rushed, we still received an ending that was still pretty cool. 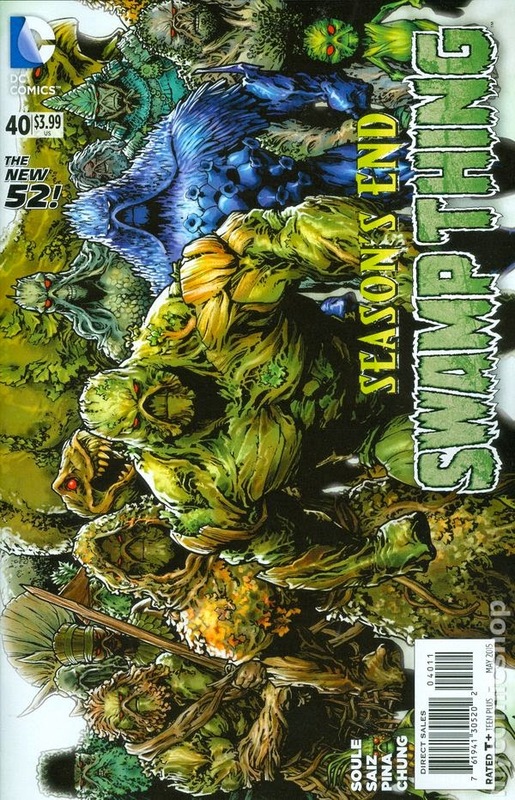 RECOMMENDED!…for Swamp Thing fans. The Spartacus Workout - <phew> Okay, just thinking about the “The Spartacus Workout” that I found in Amy the intern’s women’s exercise book — don’t worry, it’s the same in the men’s version of the book — and used to do a few years back tires me out. But having given it a whirl after a break of a few years, I can’t believe I’m up and moving around. Criminy, I only did two of the three reps because it is so brutal, and now I'm sore as heck. Do I even want to attempt to do it again later today…no, but I probably will anyways. And to think, another week of “The Spartacus Workout” and I fully expect to be on the Spartacus television show in the next season. Wait…what? The show ended? Huh…oh well, I’ll still be totally ripped. Time for some French fries. On a side note, have any of you denizens watched the Stars Spartacus show? I’m almost done with the final season, and I am loving it despite the RIDICULOUS treatment of the bloody battles. The slow motion, the fountains of blood, the screams, the sound effects, it’s all so over-the-top that I can’t help but laugh over how uncomfortable it makes me. I wouldn’t be surprised if a character opened up a scroll only to cut their finger in slow motion as blood sprays out to soak the camera and the character screams with rage-filled anguish. Geez Louise. Still, it’s dumb fun, and refreshingly accepting of homosexuality.